[151 pages report]The global milk replacers market is estimated to be valued at USD 2.45 billion in 2017; this market is projected to reach USD 3.54 billion by 2022, at a CAGR of 7.59%. Secondary research was conducted to obtain the value of the milk replacers market for regions such as North America, Europe, Asia Pacific, and RoW. The key players were identified through secondary sources such as the Bloomberg, Businessweek, Factiva, agricultural magazines and the annual reports of the companies, while their market share in the respective regions was determined through both, primary and secondary research. 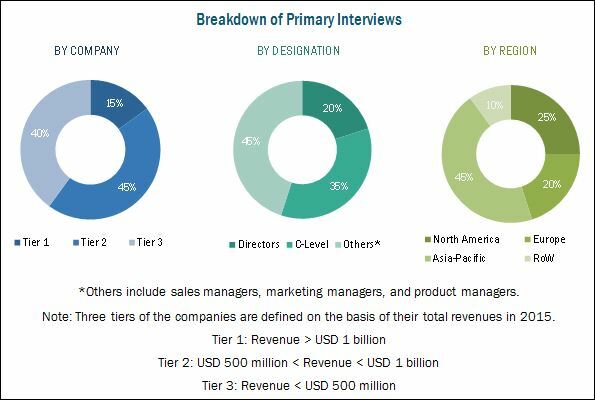 The research methodology includes the study of annual and financial reports of top market players as well as interviews with industry experts (such as CEOs, VPs, directors, and marketing executives) for key insights (both quantitative and qualitative) for the milk replacers market. The contributors involved in the value chain of the milk replacers market include raw material suppliers, R&D institutes, milk replacers manufacturing companies such as Cargill (U.S.), Archer Daniels Midland Company (U.S.), CHS Inc. (U.S.), Land O’ Lakes (U.S.), and Lactalis Group (France), Glanbia, Plc (Ireland), VanDrie Group (Netherlands), FrieslandCampina (Netherlands), Nutreco N.V. (Netherlands), and Alltech (U.S.). Further breakdown of the Rest of Asia-Pacific milk replacers market into Australia and New Zealand. Further breakdown of the Rest of Europe milk replacers market into Netherlands, Russia, and Italy. 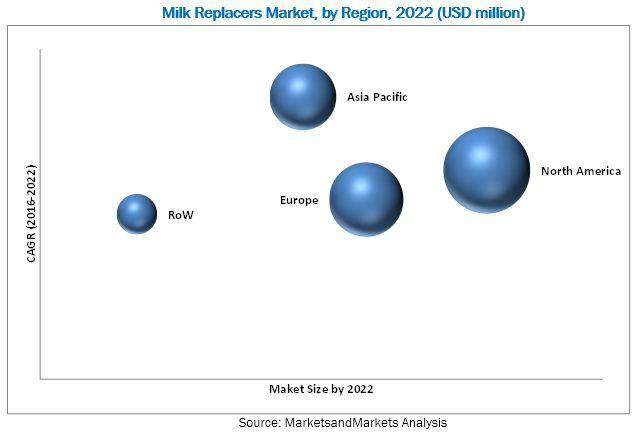 The milk replacers market was valued at USD 2.4 billion in 2016 and is projected to grow at a CAGR of 7.6%, to reach USD 3.5 billion by 2022. The milk replacers market is driven by the rise in milk prices, increase in awareness of cost-benefits and nutritional aspects of milk replacer products, adoption of precision nutrition techniques, concerns regarding mortality and health-related aspects, and rise in nutritional mismatches in the initial birth stage of livestock offspring. Based on type, the market is segmented into medicated and non-medicated. The non-medicated segment accounted for the largest share in the milk replacers market. The larger demand for non-medicated replacers has been attributed to its low prices. The medicated milk replacers segment is projected to be the faster-growing during the forecast period. Due to this, their demand in developing countries such as Brazil, India, and China is increasing as livestock bearers are very cost-conscious and the dairy farming industry is being increasingly organized. Based on livestock, the milk replacers market is segmented as ruminants, swine, and others. Ruminants are estimated to form the largest segment during the forecast period. Raising healthy calves is one of the major requirements for livestock in general and ruminants in particular, given their use for dairy and meat production. Calves are born with only the abomasum, that is, the fourth stomach functioning, owing to which the digestion in calves is entirely dependent on the enzymes existing in the abomasum. Hence, infant ruminants are fed with high-quality milk replacers, which help fulfill the nutritional needs of young calves and boost their immunity against diseases. Based on source, the milk replacers market is segmented as milk-based, non-milk-based, and blended. Milk-based replacers formed the largest segment among the sources. Milk-based replacers are most commonly used to feed livestock offspring, as their digestive systems are adapted to function on milk, and thus, these replacers are ideal alternatives for whole milk to provide essential nutrition to baby mammals. These replacers are mostly used in developed countries, including the U.S., Germany, and Spain, primarily due to high awareness about the benefits of milk-based replacers. Based on form, the milk replacers market is segmented into powder and liquid. The powder of milk replacers formed the largest segment. Powdered milk replacers are cost-effective alternatives to whole milk feed for infant mammals. They are a mixture of ingredients such as whey and sodium caseinate. Powders are easy to handle and store, which are some of the main reasons for their increased demand among animal rearers. Due to the growing demand for ingredients of milk replacers, the overall prices of milk replacers have been increasing since 2006. The Asia Pacific region is projected to witness the fastest growth in the global milk replacers market. Progressive urbanization in Asia-Pacific and an increase in demand for quality animal products result in farmers focusing on the inclusion of nutritional ingredients in the diet of young livestock in order to ensure ideal productivity growth. Given the nutritional benefits of milk replacers, along with their cost benefits as supplements, the demand for milk replacers in this region is witnessing an upward trend. Furthermore, the increasing acceptance and resultant demand by the dairy farming industry has an impact on the milk replacers market in this region, and it hence leads to the scope for development in the coming years. The inclusion of antibiotics remains a matter of concern and is one of the major challenges faced by the milk replacers market. Antibiotics are added to some milk replacer products, mainly because producers usually rear their own livestock on-farm, and new diseases can be introduced through bought-in animals. Regular use of antibiotics increases the risk of cull calves being sold for slaughter with detectable levels of antibiotic residues in their carcasses. The EU banned the use of antibiotics in 2006; however, in the U.S., antibiotics are commonly added to milk replacers in an attempt to protect calves from infection. Key players such as include Cargill (US), Archer Daniel Midland (US), CHS Inc. (US), Land O’Lakes Inc. (US), and Glanbia Plc (Ireland) have a strong presence in the Americas, followed by the Asia-Pacific region. These companies are focusing on strategizing their growth plans to expand their operations in the milk replacers market.